Pastel buildings in Cienfuegos, Cuba. In March 2018 our Chief Blogging Officer, Bonnie MacLaird, sailed on Azamara’s first Cuba-Intensive voyage. These destination intensive voyages are designed to allow time to thoroughly explore a particular country with multiple stops and extra time in port to venture further afield. March 12, 2018: The 690-passenger cruise ship, Azamara Quest, arrives in Santiago de Cuba, our first port-of-call to the island country of Cuba. The ship will spend the next 22 hours in this tropical city that was founded in 1515. Santiago de Cuba was the first capital in Spanish-colonized Cuba. It was also the main port of entry for the slave trade from Africa; the home of the national hero and poet, José Marti; the ancestral home of the Bacardi Family; and where Fidel Castro and his small band of revolutionaries first attempted to overthrow the dictatorship of Fulgencio Batista. I’ve joined this cruise to learn firsthand about Cuba and to experience visiting Cuba by ship. I, like almost all US baby-boomers, have never visited Cuba. Generations prior to mine could visit, and many did in the 40s & 50s when Cuba was the place to be seen. I’m curious to find out what Cuba and the Cuban people will be like. In Santiago de Cuba our first visit is to the 1638 fortress called Morro Castle. This is truly the best example of Spanish-American military architecture. We pass over the moat, climb through various rooms, some of which house museum exhibits, and wander along the wall snapping photographs of the surrounding areas. Outside are what I believe to be very good arts & crafts on sale, but then on the next two stops, I find the exact same goods. But on the upside, I have most of my gift souvenirs purchased for the entire trip! We also visit the Lomo San Juan, where on July 1, 1898, Teddy Roosevelt and his Rough Riders fought the Spanish during the Spanish-American War. It is also where significant casualties occurred so Cuba has erected separate monuments honoring the Cubans, the Spanish, and the Americans who died here. Next, we stroll the main plaza where I get my first chance to talk to the locals sitting on benches, strolling through the outdoor exhibit of women who were influential in the Cuban Revolution. They seem genuinely interested in us, and that we are Americans visiting by ship. This evening is the AzAmazing Evening at the Teatro Heredia. This is a modern (1991) performance theater located a brief 10-minute drive from the port. We are met with waiters carrying trays of mojitos (rum, soda, sugar & spearmint) and a female group singing traditional Cuban songs. Music is the soul of Cuba and tonight’s performance at the Teatro Heredia is a sparkling medley with a strong emphasis on the Afro-Cuban heritage of the southeastern region of Cuba. March 14: Two days later we dock in Cienfuegos where we will spend 14 hours. During yesterday’s sea day I attended the Enrichment Lecture entitled Cuba: Jose Marti and the C’s; Castro, Che, and Cienfuegos. What everyone quickly notices while visiting Cuba are the ever-present images of these historical figures. The lecturer points out that each can be recognized by identifying the hat each wore, which I find very helpful since these images are everywhere! Cienfuegos, being one of the ‘newer’ cities of Cuba, was founded by French immigrants in 1819. Cienfuegos is gearing up for its 200-year anniversary celebration so 2019 would be a great time to visit! 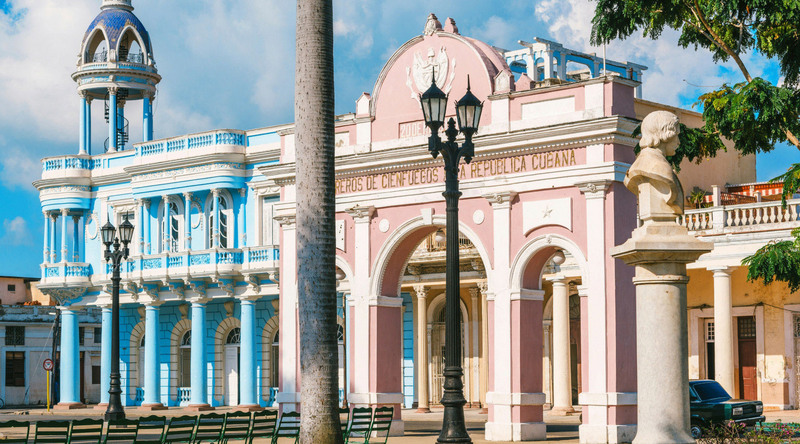 With the long stay in Cienfuegos, I decide to visit the preserved colonial city and UNESCO World Heritage site of Trinidad, located about an hour an a half away by bus. This lovely pastel, cobblestoned town was founded in 1514 and was once home to the barons of the sugar trade. We visit a shop to see pottery being made and the main cathedral where we learn about La Virgin de Caridad, which is Cuba’s version of the Virgin Mary (or most similar to Mexico’s Virgin of Guadalupe.) We enjoy lunch in town, then have a bit of free time to wander the picturesque streets. The delightful aspect of Trinidad is its people. There are welcoming faces everywhere, as well as pairs of teenagers and gaggles of smiling children dressed in their school uniforms. The shopkeepers are visually surprised when I say I’m from California; perhaps because I’m speaking to them in their native language, Spanish. (Note: I had a Spanish teacher for 4 years who was Cuban!) In retrospect, Trinidad is a favorite not-to-be-missed experience in Cuba. In Cienfuegos and Trinidad we had an excellent tour guide, Annia, who is a history professor on the side and is willing to answer any question we pepper her with; and we don’t hold back. We learn everything from the free school system in Cuba, the religious composition of Cuba (60% Catholic, 20% Santaria, 20% everything else), Internet on the island (cost prohibitive for the average Cuban), guns in Cuba (not allowed), the unemployment rate (3%), taxes (none unless one owns a private business then 10% of profit), mandatory social service, conservation efforts in the country, animals native to Cuba, ability/inability to travel internationally, elections, food availability, income levels, that the sugar market collapsed in 2001 so now tourism is their #1 export, followed by sending medical services abroad which is their #2 export. We realize how important it is to really spend time talking to the locals to learn about their lives. I’m reminded of a well-known quote by Arthur Frommer “At its best, travel should challenge our preconceptions and most cherished views, cause us to rethink our assumptions, shake us a bit, make us broader minded and more understanding.” This certainly applies to Cuba. March 15, 2018: During the sea day between Cienfuegos and our next destination, Havana, I attend two more Enhancement Lectures on Cuba. I want to absorb as much as I can about this captivating destination and its history. I also take a complimentary course in Smartphone Photography. March 16, 2018: We sail into the Bay of Havana and what a sight to behold! I’m not sure what I was expecting but I was certainly not expecting the magnificence of the Spanish fortresses on one side of us and the skyline and Malecon waterfront of Havana City on the other side. We will be docked right at the foot of Havana Vieja for a 49-hour visit and the guests have lined up excitedly along the railings to view the approach to this fabled city. I’ve signed up for a tour of the city sites for my first day, to get my bearings. We visit the 1630 Spanish fortress, the Cristo Havana erected in 1958, the impressive 1862 cemetery where the who’s who and elite of Cuba are buried, the Revolution Square, we pass the outdoor military museum, the Hotel Inglaterra, the National Hotel, and the 1762 University of Havana. We are shown, of course, the Malecon and the main shopping street La Rampa that seems to have only hotels and ice cream parlors. Consumer shopping as we know it is non-existent in Cuba, and word to the wise, credit cards are not widely accepted. Cuba’s economy is hamstrung by the bloqueo and consumer goods are in short supply. So while the residents’ basic needs are covered there is the frustrating awareness that they are doing without what we take for granted, such as Internet or even shampoo. But in spite of these shortages, the people are warm, friendly and welcoming to visitors from the world. Ernest Hemingway's desk, as seen during the "Hemingway's Hideaways" tour. March 17: It is our second day in Havana and I’m off on a tour called Hemingway’s Hideaways. We start with a narrated walk around old-town Havana where we pass the Ambos Mundos Hotel, where Hemingway kept a room that is now preserved as a museum. We also pass by a couple of his favorite bars, La Floridita and Bocadita del Medio, but one assumes he had plenty of such favorite hideaways! Next is a bus ride to La Finca Vigia, his estate outside of Havana proper, where we wander the grounds and peer into the house from the unscreened windows on every side. Here is where Hemingway wrote For Whom the Bell Tolls and Old Man and the Sea about a Cuban fisherman from nearby Cojimar. After arriving back at the ship we are free to wander Havana as we wish. Tonight many opt for a nightclub visit or another private outing. March 18: Our last day in Cuba; the ship sails at 3:00 p.m. I start the morning on a walking tour of Havana’s plazas and historic architecture. I eventually peel off to explore cafes, one of my favorite pastimes in a foreign country. I am back aboard by 2:45 p.m. and ready for the sail-away. It’s mind-boggling that this amazing country with so much history, that played such a role in the Spanish Conquest, Ponce de Leon’s search of Florida for the fountain of youth, as well as the economics and the geopolitics of the region, is only 247 nautical miles from Miami. By tomorrow morning we will be back in Miami and reliving our visit to Cuba!